SAVANNA3D R6 contains over 1,300 detailed 3D architectural models in 3DM format + 12 Grasshopper definitions to create parametric models. These models, which include furniture, fixtures, 2D-People, office equipment, TVs, and more are ready to be inserted or imported into Rhino 6 to give you a head start and they have preset materials from Rhino 6. You can edit them as any other Rhino 6 object. All the materials are 100% included in Rhino 6. Click here to play the promotional video! 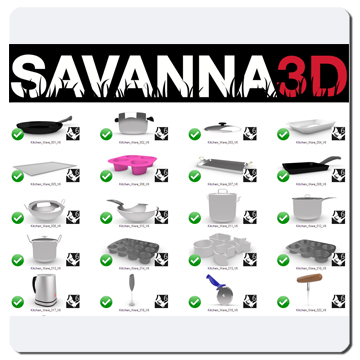 SAVANNA3D R6 includes 12 Grasshopper definitions to create parametric models. Learn how to use each one of these definitions here! Before you use any of the Grasshopper definitions included in SAVANNA3D R6, you should know these three things about the files!